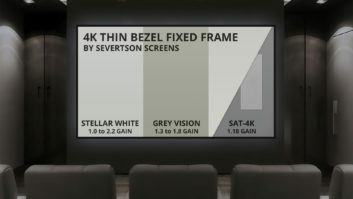 Severtson Screens' new folded SēVision 3D GX line of cinema projection screens now includes the microperf screen as an option. Severtson Screens’ new folded SēVision 3D GX line of cinema projection screens now includes the microperf screen as an option for international shipping. “Launched at the recent CinemaCon 2014 event to rave reviews and popularity worldwide, our new folded shipping method now makes international distribution of our industry-acclaimed SēVision 3D GX highly affordable, reducing international shipping costs by up to 70%,” explained Toby Severtson, president and CEO of Severtson Corp. The Severtson micro-perforation (microperf) viewing surface eliminates moiré, which is often a problem for screens with larger perforation, yet continues to provide a more realistic soundstage, allowing speakers to be placed directly behind the screen. The Folded SēVision 3D GX line of cinema projection screens are claimed to offer up to 15% better sound transfer over standard perforated screens, while providing optimum visual performance at the same time. According to Severtson, the idea of folding a screen for shipment, delivery, and installation had previously been deemed impossible because there was no method of doing it without degrading the quality and performance of the screen, or ruining it altogether. Today, the cost offset on shipping as well as the screen’s performance and longevity increases savings for the customer. This is big news for international markets that desires a state-of-the-art silver 3D cinema screen, but, up until now, simply could not afford the shipment and installation cost because of how such a large screen had to be prepared, packed, and shipped.